When viewed in a Chrome 73 (MacOS Version 73.0.3683.46 (Official Build) beta (64-bit)) the RTE displays an empty raw HTML Document. Thanks for the reports. I will see how time fits to fix this for RTEHtmlArea + TYPO3 v8. However, this repository only supports RTEHtmlArea for TYPO3 v8 LTS, so any issues regarding TYPO3 Core 6.2 and 7.6 won't and can't be addressed here, as the code base of the extension has changed since TYPO3 6.2/v7 (e.g. no ExtJS anymore). If you have an active ELTS for TYPO3 v6.2/v7, there is a fix underway for the included RTEHtmlArea as well AFAIK. If you don't have ELTS, now is a good time to evaluate this https://typo3.com/products/extended-support. That's it - 6.2 seems to automatically notice the file has changed and creates a new merged file containing the change. In 7.2 the file gets served with ?bust=..... meaning if your server asks clients to cache JS for x days it will be a while before the change reaches them. Any idea how I can forcibly change this bust value? 8.7 picks up the change instant. Many thanks to @guppy42, I was fiddling at the same line and wondered what happens here. I will create a PR for this. be an empty page for WebKit browsers. Worked – thanks a lot! Thanks a lot for the fix! That worked as expected. can't handle this and treats `about:blank` as a cross origin. I've tested successfully with my TYPO3 ver. 7 but with my version 6.2.40, nothing works... Is it possible to remove browser detection or at least the Chrome detection? Is it related to the browser signature? How would this line look for Typo3 7? Like so? Is there a chance that the problem will be fixed with Chrome version 74 or do we definitely need to patch rtehtmlarea js files? The 6.2.41 version worked on our second server... we are redoing the first one and retesting. I can confirm. For me an update to latest ELTS version 6.2.41 worked as a fix! 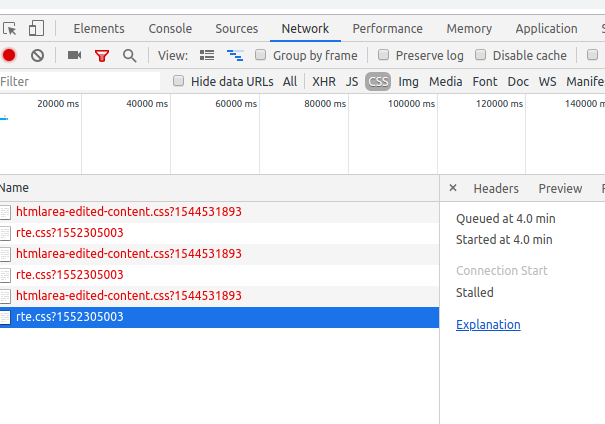 Would be nice if someone hit up the Chromium issue tracker and created a new issue - or contributed to one if one already exists that might be related to this problem. This way we're not just spinning up workarounds but they can actually investigate and resolve that issue. I don't think this is a bug in Blink rendering engine, but a security change that breaks our legacy code base, which is absolutely fine. I don't consider the fix(es) a workaround, but necessary changes to let HtmlArea work with the latest versions of the rendering engine. Is there a fix for 8.7 already? I'm looking for a fix for Typo3 8.7 too. You should be able to update the extension either from TER or packagist. @andreasfernandez Yes i did that already, i upgraded to version 8.7.2 but this didn't resolve the problem. @mmasmoudi I fail to reproduce the issue after upgrading to 8.7.2. Did you clear your browser caches after installing the update? @andreasfernandez Sorry, forget clear cache from browser after the TER update, problem is resolved, Thank you ! After installing the Patch i can use the RTE, but it's not possible to save an empty RTE. Each time i save the content element, a linebreak is added too the textarea an in the frontend i get an empty p tag for every linebreak. In WYSIWYG-MODE, the linebreaks not shown, only in TEXT-MODUS they are visible. Have you delete some files after the fix? Also if I delete the compressed file it create the same htmlarea_cumulative__compressed-.js with old code..
but it returns every time the same old code in typo3temp/compressor/htmlarea_cumulative__compressed-.js Have you delete some files after the fix? Also if I delete the compressed file it create the same htmlarea_cumulative__compressed-.js with old code..